Eric P. Newman (1911-Present) was born at St. Louis, Missouri on May 25, 1911, son of Dr. Samuel Elijah Newman and his wife Rose Pfeiffer. He attended college at M.I.T. and graduated with a B.S. in 1932. 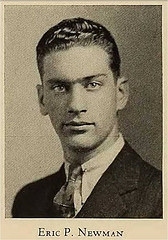 In 1935, he graduated with a J.D. from Washington University, St. Louis, Missouri, and that August passed the bar exam. In 1939, the year of the New York World's Fair, he advanced as a collector and was named Secretary of the Central States Numismatic Society. That same year he married his wife Evelyn, and they have two children, Linda N. Schapiro and Andrew E. Newman. He practiced law from 1935 to 1943 when he entered the corporate world working for Harry Edison, president of Edison Brothers Stores, Inc., Atlanta, Georgia. In 1968 he was promoted from Treasurer to Executive Vice President and Secretary of Edison Brothers Stores, Inc., St. Louis, Missouri. He retired from corporate life in 1987, and approaching his 30th anniversary of retirement. And the best is yet to come! Eric Newman has enjoyed one of the longest and most colorful numismatic careers in American history. He is loved by countless collectors who have enjoyed reading his well researched articles and books on numismatics which spans 75 years in 2016. That's longer than the Chapman Coin Dealing Dynasty (1875-1948). Among the numerous anecdotes are such stories as the time B. Max Mehl asked him to be a shill bidder in one of his auctions, and the moral giant of integrity Newman flat out told him, "No!" He began collecting coins at the age of five in 1916 the same year the St. Louis Numismatic Society (founded October 1915) joined the ANS. It was when grandpa Pfeiffer gave him an 1859 Indian Head copper-nickel cent. At the time the coin was fifty-seven years old. Today it is one hundred and fifty seven years old. 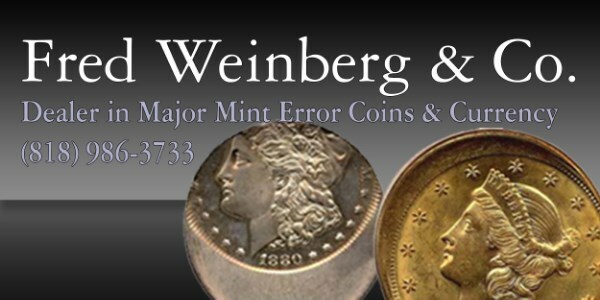 In other words, Eric Newman has been collecting coins for a whole century now and didn't even start with a red cent, it was gray. He entered the coin world in his youth when at age ten he befriended Burdette G. Johnson, the second owner of St. Louis Stamp and Coin Company, St. Louis Missouri in 1921. He applied for membership in the ANA in December 1934, and in January 1935 was given ANA Member No. 4624. 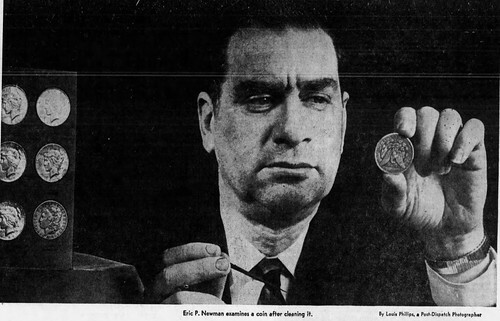 On February 15, 1938 Newman is among the founders of the Missouri Numismatic Society and is elected first Vice-President. During the 1940's together with Burdette G. Johnson (1885-1947), Newman acquired a large portion of the Colonel Edward Howland Robinson Green (1868-1936) coin collection. 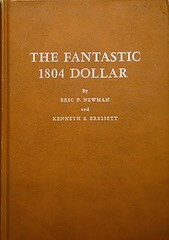 In 1962 he co-authored with Ken Bressett, The Fantastic 1804 Dollar. 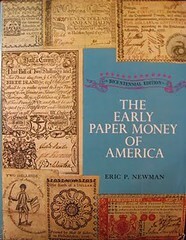 In 1967, he published The Early Paper Money of America, which is now in its 5th edition, with a 6th edition forthcoming. 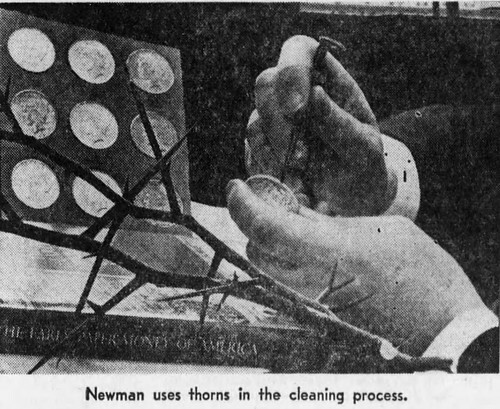 Also in 1967 Eric Newman mastered the thorny subject of cleaning coins giving a whole new meaning to the phrase and simultaneously also to another "How to pick a coin." May 25, 2016, Happy 105th Birthday!